Mathiane stumbled upon her grandmother’s story well over a century after the gruelling events of the Battle of Isandlwana that formed her life. Astounded to hear how her grandmother had survived the Anglo‐ Zulu War as a young girl, Mathiane spent hours with her elder sisters reconstructing the extraordinary life of their grandmother. The result is a sweeping epic of both personal and political battles. 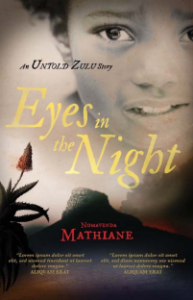 Eyes in the Night is a young Zulu woman’s story of drama, regret, guilt and, ultimately, triumph – set against the backdrop of a Zululand changed beyond recognition. A true story almost lost, but for a chance remark at a family gathering.